Once upon a time, Hyrule's tranquility was shattered by the arrival of several disasters. The calamities brought dark, ominous clouds which shut out the sun. Surprisingly, it came to light that a magician was to blame for the disasters. Just as the people were about to lose all hope, the sun miraculously returned. Link, who was summoned by Zelda to find the cause of the disasters, successfully defeated the magician. The people of Hyrule rejoiced int he belief that eternal peace would rule. It became clear that the magician responsible for the disasters was in fact controlled by and evil sword called Soul Edge, which existed in another world. Furthermore, the fragments of Soul Edge were gathering together in this other world. 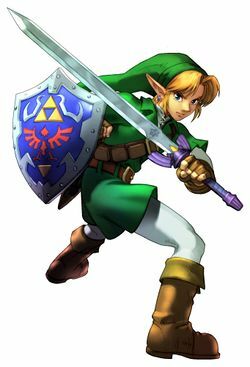 Link gather his trusted Master Sword, Hylian Shield, and Ocarina, and set off on a secret journey. The broken wall of the chapel reveals a somber scene of the castle ruin looming in the distance. The ruin is what remains of Ostrheinsburg Castle that bore witness to the clash between Soul Edge and Soul Caliber four years previous. This chapel was the epicenter of the events surrounding Nightmare that transpired a few years before then. No one has dared visit this chapel ever since, but mysteriously, some say that the chapel bell can be heard once in a while. Rumors say the bell rings itself in honor of the chosen warriors. This page was last edited on 26 January 2012, at 19:42.